Thanks for the invitation to the writers’ convention in Rio de Janeiro. I was tempted to cross the oceans but there is a special game at Anfield this weekend, and such events only happen every 24 years. Talking of football stadia, the World Cup venue in Rio is behind schedule. Anyone with experience of projects knows what happens. The year in the plan allowed for review and testing has been reduced to one month. 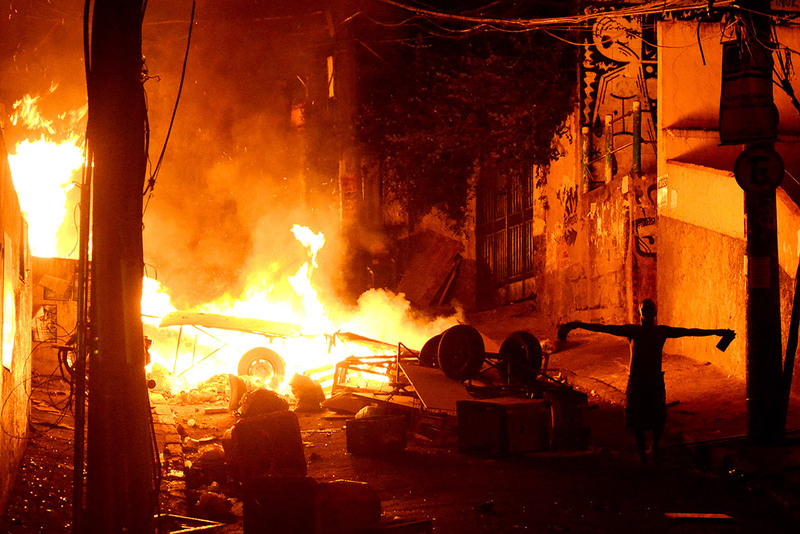 If that does not panic FIFA, the favela on the hill above the Copacabana has rioted against police brutality. More worrying for the authorities, the residents came down the hill to make their protests. This happened amongst the rich. People were killed close to the proposed hotel for the English team. The England manager is notorious for only being able to play one style of football. He is not a man you would depend on for a contingency plan. The riots took place a mile away from the beach but that is Brazil. A month ago the Pope was there and the sand was dripping with piety. The country has to be seen but the sensible pick the days and spots. The riots have produced casualties. A 27 year-old man was shot in the head, and a 12 year-old boy was hit. The protesters from the favela claim that the police beat a resident to death. Douglas Rafael da Silva Pereira was a dancer and popular. Whatever Brazil lacks it is not dancers. The protest has been a response to inexplicable brutality. Pereira was chased into a nursery and there he was kicked to death. The dancer had called at the nursery to collect his four year old child. The dead need alibies no more than Brazil needs extra dancers so this story sounds awfully plausible. Most people would hesitate as they carried guns, or even heavy boots, into a nursery, think that maybe a nursery is not the place to have a confrontation with a drug dealer. And perhaps that hesitancy could have reappeared after the first boot landed on the dancer. Evidently not. Pereira was kicked to death. His mother said that his body was covered in boot marks. Neighbourhood policemen note, avoiding the face is not always the best strategy. The political amongst the protesters are obliged to think about local anger and World Cups. The tension can be exploited to make social demands, and who can be critical of the organisers if they do have a secret purpose. The Brazilian economy is an extreme version of what happens elsewhere. Capitalism has a good record of feeding the people of the cities. Housing the poor, though, requires political intervention, and without it unrest festers amongst the brutalised. The ambition of cleaning the favelas of drug dealers is worthy because the dealers ruin lives. But the scandal is not how drug lords have taken over shanty towns in Brazil or sink estates in Liverpool but that they exist to be claimed by the ruthless. Posted in Brazil, Innocent Mosquitoes, Travel and tagged Brazil, football, international, news, politics, riots, world cup on April 25, 2014 by Howard Jackson.